James (Bub) and I try to do date night once a month but after our 6 year wedding anniversary and 9 years being partners, we decided to go on a solo adventure without our 4 children. When we planned our trip, we originally thought Yosemite. But after we applied for our permits, all 3 locations we listed were denied. 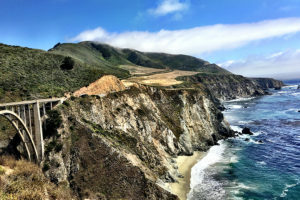 So our second choice was Big Sur–plus it was super simple to just go without a permit. I couldn’t have asked for a more challenging excursion for us both as parents with the most amazing Ventana Wilderness views. 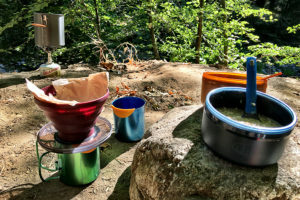 Sykes Hot Springs was 10 miles away and our goal. We got a late start. We were pretty ready but took our time enjoying packing without interruption, shopping for last-minute necessities in silence, and talking about our trip up. I imagine most parents who get even a day off are taking time to savor each moment shared alone. That is just what we did. We stopped like tourists on our way along Highway 1 to gawk at the Bixby Creek Bridge and stood side by side to other tourists that were thinking the same thing–stop, get out and take a photo. We then stopped at the General Store in Big Sur to fuel up with lunch (we got veggie burritos) and check out the area. As we pulled into Big Sur Station, we saw a group of teenage boys rush their vehicle and throw their packs on the cement while simultaneously letting out sighs of instant relief in unison. By the time we got to the trailhead it was already 3pm. 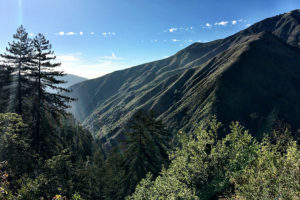 After putting on our boots, checking our packs and dropping our parking payment in the collection box, we headed towards The Pine Ridge Trail–the only trail we would be on most of the trip. After about 3 miles of just hiking upward, I was thinking positively–besides the slight back pain I was starting to feel, I was in awe of just being able to carry 30lbs strapped to me hiking longer than I do with Poppy on my back. The views were crazy beautiful and there were tons of switchbacks that provided little shade. The afternoon sun was relentless and the scenery was my refuge when I began to feel the sweat drench my back. I was so thankful my pack cinched above my waist. Bub and I did little talking the first part. He was so focused on keeping us on pace and getting through it. I had to keep reminding myself that I was with an Eagle Scout and avid backpacker. I think we were also getting into our groove of just making it through this first 4 miles of climb. We finished the 7 miles going into the evening at about 7:15pm. That was an awesome pace, but man, we were pooped. I did extensive research about the Pine Ridge Trail and what camps would be available to us on the way to Sykes Hot Springs. I don’t remember passing up the first camp, Ventana Camp, but I do remember Terrace Creek, and our camp we ended up at–Barlow Flat Camp. Once we got to Terrace Creek, we were already immersed in the Redwoods, deep among the trees and coolness of the air. We also descended down a bit before making more climbs up for a few more miles to Barlow. The thing that stood out about Terrace Creek was it was nestled along the streams with pockets of remote sites. It was a beautiful camp but we wanted to press on to shorten our trip to the hot springs. It was another 3 miles to Barlow before we set-up, eat, wash up, sleep. In that order. The pep in our step was real by now. We saw the sign for Barlow Flat and gasped in relief. We had to descend down into the camp and I heard kids below. My first thought was damn–I’m not gonna lie. This night is going to end with me being a mom and figuring out some way we could work out a nice quiet evening. They ended up being angels and I was too tired to care either way. So…two things: The water in the streams were so loud I hardly slept a wink. Well, maybe we slept some but it was mostly because our bodies forced us too. Second, our mattresses were good ones, but our bodies cried for more cushion. We had the best mattresses, but alas, the trail had no mercy on our bodies. The pain was not enough to deter us away from our 3 mile hike to Sykes to enjoy the hot springs. 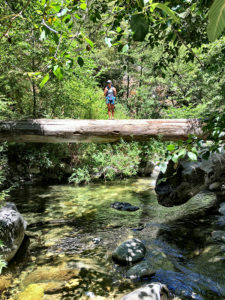 We made it there and we noticed there were some groups scattered along the clear stream waters surrounded by rocks and trees that dipped into the water as natural bridges to cross each side. After waiting a bit for the groups to break and settling in for a snack and lunch (we were starving and realized our appetites needed tending to more often) there was a pool open! We climbed in with another couple and sat in up to our butts. It was lukewarm but rewarding after our hike. After a few minutes we got out and looked for a spot further down the water holes to set up for lunch. Clear water with trout darting throughout, rocks, and redwoods–we refilled our water bottles up using our filter and made our way back to camp after about 2 hours. 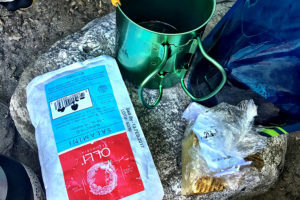 Once we got back to camp we took the spare hours we had to take a dip in the streams, get comfy, and make a nice dinner of lentils with seasoned wild rice, manchego cheese, salami, and the plastic pack of red wine we bought a couple of days earlier. 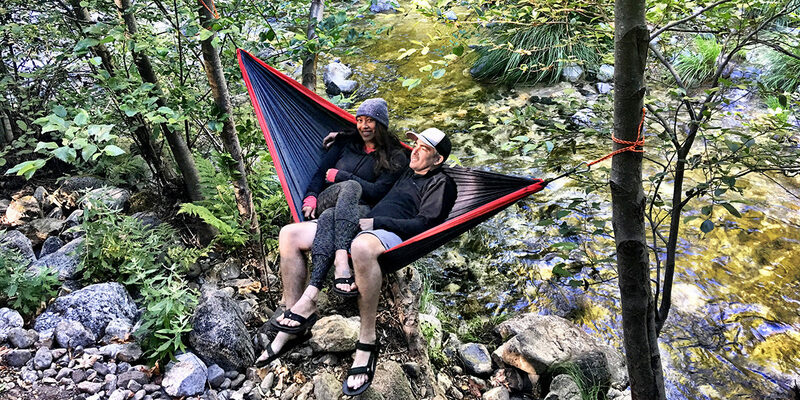 We feasted on a flat rock and gulped our wine listening to the water then swung in our streamside hammock. 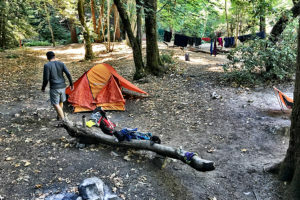 We broke down and packed what we could before we turned in, so we could have an early start in the morning back to the Big Sur Station parking lot. The hike back was short but also the longest hike EVER. It was 7 miles from Barlow Camp and just climbing up the rocky terrain from below was hard. We had forgotten the trip there was easier–once we started up the hill, I was out of breath at the top. The first 4 miles were easy. It was the last 3 that felt like an eternity because I started to expect how much closer we were to civilization and a clean pair of clothes in the trunk of our vehicle. 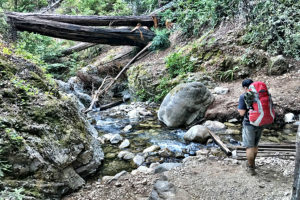 I remembered little parts of the trail: the shade less pass along the ridge, the grove of baby redwoods, the rocky slope that seemed forever to get past, the fallen trees we stumbled over. It all came back in a flood of appreciation and I while I rushed in the hike back, I was getting sad too. 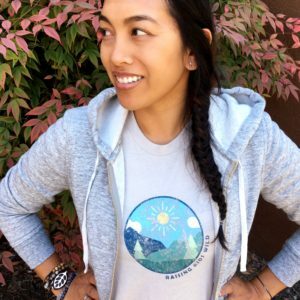 It was the hardest hike I’d ever done and I did it with my husband without kids. Without kids. I’m strong without them. I started thinking on the way back how much I had accomplished in such a short period. Just shy of almost done, I felt tears well up in my eyes. I was done, I missed my kids, and had two hot spots starting to bite me on my toes. I wanted to peel those boots and socks off so bad and hike in flip-flops but knew if I stopped I would not keep going. I pushed myself till the end and when we made it, my pack dropped immediately and I knew right then what those group of boys felt when we started a few days ago. 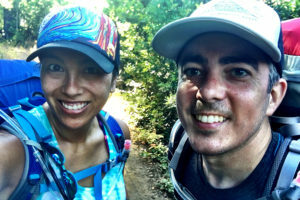 We finished over 27 miles of difficult terrain in 3 days–we were tired but refreshed and ready to face our kids again hopefully as better individuals and a couple.